Ruby has some nice things (like Perlish regular expression handling), but it brings back all that punctuation noise again. I go back to Perl and my eyes bleed after trying to dereference a reference to a scalar, or something like that. It’s just ugly in Perl. I don’t think that’s fair to compare Perl’s ponctuation noise with Ruby. Ruby has a feature that could qualify as punctuation noise, but it’s really a feature: variables are prefixed with their scope. For example, class variables start with @@ (@@var), instance variables start with @ (@var), global variables start with $ ($var), and constants are in CAPS. I don’t know if Ruby “invented” that, or if it comes from another language (it’s probably the case: Ruby takes a lot of good ideas everywhere). Also, Andrew, joining elements of an array in ruby is written myarray.join(” “), and Ruby has =~. So you should definitely give Ruby a try ;) No, seriously, Ruby is a really interesting language. It’s really a shame that it’s still so japanese-centric (most development decisions are taken on a japanese mailing list !! ), since it’s not really help a wide adoption. NEW is currently nearly empty (only 3 packages), and there are only 2 NMs waiting for DAM approval. Some people deserve beers (… or milk ;) )! I was wondering how Debian compared, so I made some stats using the debian-devel-changes archives. 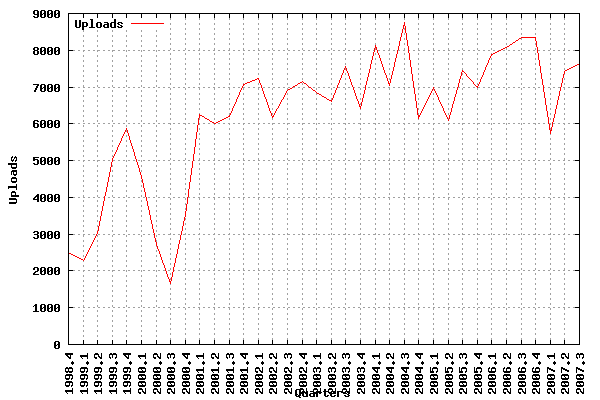 It’s interesting to note that, while the number of packages in Debian increased a lot, the number of uploads basically stayed the same since 2001. The number of active devs has been slightly decreasing over the past years. The difference between the number of different changed-bys and the number of different keys should be the number of sponsorees, if I understand everything correctly. 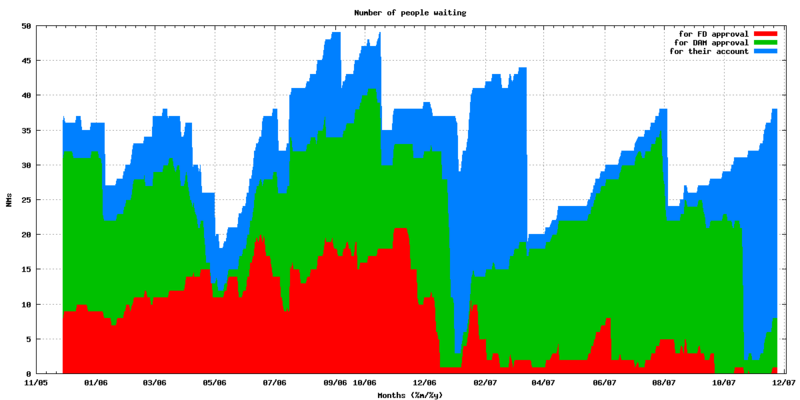 It is increasing a lot, which probably means that we have a bandwidth problem at integrating new contributors. Hopefully the DM GR will help at reducing that gap. I can provide the raw data on demand, if someone else want to work on this. There’s probably a lot of other interesting things to do!